Live entertainment, delicious Northwest cuisine and amazing views provide the perfect ingredients for a Portland dinner to remember. 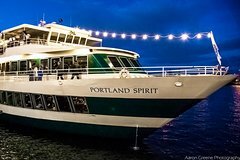 Whether it's a romantic dinner for two, a birthday party, or an office party with a twist, this two and a half hour cruise on the Willamette River is perfect for Portland natives and newcomers alike. Live entertainment, delicious Northwest cuisine and amazing views provide the perfect ingredients for a Portland lunch to remember. Whether it's a birthday party to remember or an office party with a twist, this two hour cruise on the Willamette River is perfect for Portland natives and newcomers alike.